Immigration Minister Jason Kenney says government-assisted refugees were never intended to lose their supplemental health coverage — but that's not enough for doctors opposed to last month's cuts. A group of doctors calling on the federal government to reverse its changes to health coverage for refugees says Citizenship and Immigration Minister Jason Kenney has backed down on one of the reforms, but they vow to keep fighting until all of the old rules are reinstated. Canadian Doctors for Refugee Care says Kenney's department changed its website on Friday — a day before the cuts to refugee health coverage went into effect — to indicate that it would still provide supplemental health coverage to one group of claimants, government-assisted refugees. Kenney's office, however, denies that the department made a last-minute change to its plans to cut some of the benefits under the interim federal health program (IFHP). In an interview airing on CBC News Network's Power & Politics on Tuesday, Kenney said he never intended for government-assisted refugees to be cut off from the supplemental health coverage. "The original language in the policy had some ambiguity which we've clarified and we've now made it absolutey clear that the government-assisted refugees will receive those benefits," he told host Hannah Thibedeau. "It was always our intention to ensure that people would get covered – government-assisted refugees – would get assistance for certain medications that the UN was paying for in their camps abroad. We've clarified that and that's something we've been working on clarifying since the initial statement was issued about a month ago," Kenney said. He said the vast majority of the changes are going to affect failed refugee claimants, whom he describes as "illegal immigrants." When the reforms to the IFHP were announced on April 25, a press release said the government was ending supplemental health-care benefits so that the coverage for protected persons and refugee claimants was not more generous than what most Canadians get through their provincial public health insurance. Until June 30, the IFHP provided basic health coverage (hospital and doctor services and some diagnostic tests) and the supplemental health benefits which included drugs, dentistry, vision care and mobility devices. The department made no mention of the supplemental health benefits being maintained for government-assisted refugees, and the new regulations that were listed in the Canada Gazette publication on April 25 also don't specify that the government would keep the extra coverage for one group. Kenney's press release simply states that "the reformed program will end the coverage of supplemental health-care benefits" and it says the changes will apply to "all current beneficiaries" and future applicants. But in an interview on Friday on CBC News Network's Power & Politics Kenney said that refugees from United Nations camps who are resettled in Canada with the help of the government will see no changes to the health benefits offered to them. "They'll continue to receive everything they do now including pharmaceutical coverage because we as a federal government undertake to help them in their first year in Canada, then they qualify eventually for provincial health care," he told host Chris Hall. Kenney was also asked about the issue earlier in the day at a press conference and when responding to the criticisms he is facing for the cuts he did not mention that supplemental coverage would be maintained for some refugees. He emphasized that the reforms will cut off coverage for failed refugee claimants who have been ordered deported. At that point their status in Canada is illegal and they should not be entitled to health coverage, Kenney said. Canadian Doctors for Refugee Care said it is grateful that at least government-assisted refugees will still get the same health coverage as before, but it isn't satisfied. "Despite this reversal, many other refugees will still be denied access to basic health services," a press release issued Tuesday said. "The government's concession for government-assisted refugees is too little and too late. Many other refugees will suffer because of the cuts that are still in place." Most refugee claimants will no longer have medications for serious conditions such as diabetes and heart disease covered. Only medications that are needed to prevent or treat an illness that is a public safety concern are now covered. Dr. Philip Berger, a member of the group, said documents sent out weeks ago by Kenney's department about the changes indicated that all refugee groups would be affected by the changes. 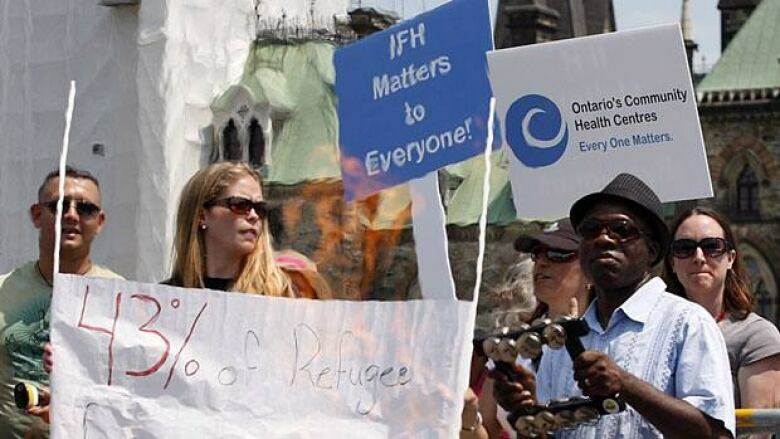 "There was no reference to government-assisted refugees being covered or exempt for the IFH cuts," he told CBC's Louise Elliott in an interview. "The government snuck these in on a Friday afternoon before a long weekend and expected people not to take notice. But it is new and the government has backtracked." The department website now says certain refugees are eligible for "expanded health-care coverage" and it includes prescription medication, limited dental and vision care, psychological care, prosthetics and home care. The doctors are vowing to keep up the pressure until all of the reforms are reversed and they are developing a surveillance system to monitor their impact.